card in play, draw a random action from your deck. card in play, summon a Risen Dead in each lane. 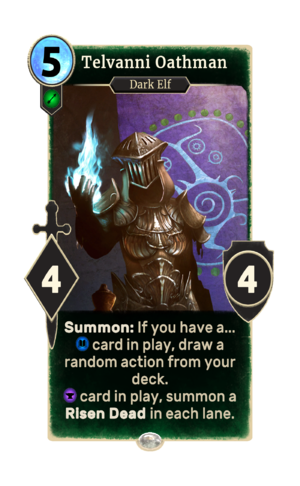 Telvanni Oathman is a common Agility creature card. It is part of the Houses of Morrowind expansion. In addition to the card's availability in the Houses of Morrowind expansion, three copies are included in the Telvanni Ambition theme deck. You can download the clip or download a player to play the clip in your browser. "You can not match Telvanni cunning." This page was last modified on 2 March 2019, at 00:24.